Porters Neck Plantation and Country Club's golf course has been named the "#1 Coastal Course" in North Carolina by Golf Digest magazine, and has been included in their exclusive list of "Top 500 Courses." 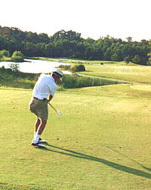 Designed by world-renowned golf architect Tom Fazio, our course meanders through gently rolling terrain and offers both the amateur and professional golfer an enjoyable challenge. Members can relax with family and friends in our stately 20,000 sq. ft. clubhouse, complete with a casually elegant dining room, full service bar, grill and banquet facilities. The athletically inclined will love our new sports complex...smash a serve on our 5 hydro- clay courts, swim laps in two sparkling pools, or workout in our fitness center equipped with CyBex equipment, an aerobics studio and male and female personal trainers.